Thank you for your interest in our Augusta GA law firm. Our Augusta practice is focused on helping persons that have been seriously injured in car wrecks and tractor trailer accidents. 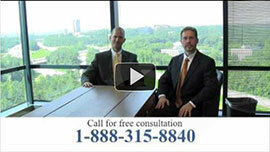 Our lawyers are experienced personal injury lawyers and we have tried cases in Augusta Georgia and surrounding areas. Our lawyers specialize in personal injury lawsuits and we do not handle any claims other than injury claims in the Augusta metropolitan area. We have over 40 years of combined experience and we are proud to assist you in your personal injury claim. If you are not able to come to our location we will gladly meet you at your home or another location convenient to you to discuss your claim. See our results and you will be confident that we can handle all aspects of your personal injury claim. Augusta attracts golfers and spectators from all over the world in April of each year. During this time driving on the highways and streets of Augusta can be a challenging task and presents many hazardous situations for local motorists. The incidence of automobile accidents and personal injury claims certainly will rise during this busy golf tournament. If you or a family member have been injured while visiting Augusta Georgia for the golfing events call us for a free consultation. If your case merits filing suit the suit will most likely be filed in the Superior Court of Richmond County. The Clerk of Superior Court is located at 530 Greene Street, Room 503, Augusta, GA 30901.